Wash the potatoes, put them in a large pot and cover with cold water. Put the lid on and bring the water to a boil. Cook the potatoes until they are tender (stick a knife into them to test if they are done). Drain the potatoes and leave them to cool until you can handle them. After they have cooled down, remove and discard the potato skins. Roughly chop the potatoes and put them in a bowl. Slice the pickles into coins and the onion into thin half rings. Add them to the bowl and season lightly with salt. 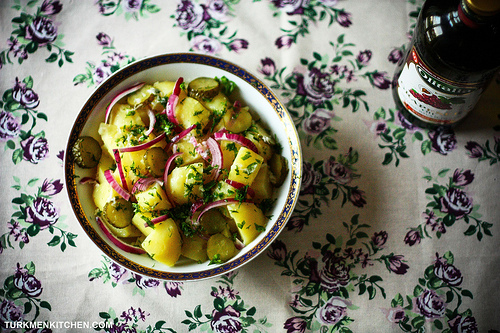 Sprinkle the chopped parsley and dill over the potatoes. Peel and grate the garlic. In a small bowl, mix the garlic, lemon juice and grape seed oil. Drizzle your dressing over the potatoes.